The Oak Leaf Hydrangea, Hydrangea Quercifolia, is a temperate shrub that grows in deciduous environments. The plant generally grows in soils that are well-drained and can hold rich, medium moisture and often sits under the shade of oaks and magnolias. It can grow to between six and eight feet in height and produces flowers that are white and shaped like pyramids, complete with dark green oak leaves underneath of it. Concerning gardening usage, the plant is used for gardening foundations, especially as informal hedges around homes and patios. It can be found in planting zones 5 through 9. 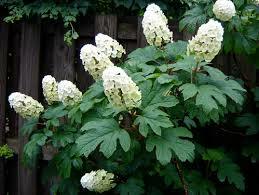 Oak Leaf Hydrangea Shrub grows in the southeastern parts of the USA. It's always or mostly discovered developing in blended Hardwood Forests on the Hillsides and Along Streams. Its Flowering season is From May to September, and its establish pleasant Cream Colored Flowers that stay till Fall, as most Plants it has a couple of nuisances, for example, Red Spider Mites and Aphids, however, it is for the most part Diseases Free. They don't take benevolent to dry out, so it is best to keep the dirt Moist and Well-Drained. They produce large flowers that appear in rounded clusters. They look amazing during the spring and early summer months each year. 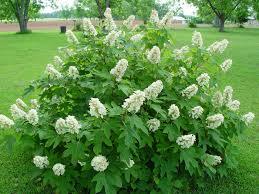 They are very easy to grow, and these shrubs are not very picky about where they are located. They provide a beautiful statement on lawns when they are in bloom and can have the appearance of giant snowballs on the shrub. These flowers can also be used to create beautiful flower arrangements so the blooms can be enjoyed inside of the home as well. The blooms on this shrub can be in a bright white color or even an off-white color. These are very popular among homeowners as they plan a garden area or landscape a lawn. Oak Leaf Hydrangea Shrub also provide gorgeous green leaves that cover the shrub before the blooms appear.